Expressions of Interest are sought for members who are interested in participating in this upcoming exhibition. 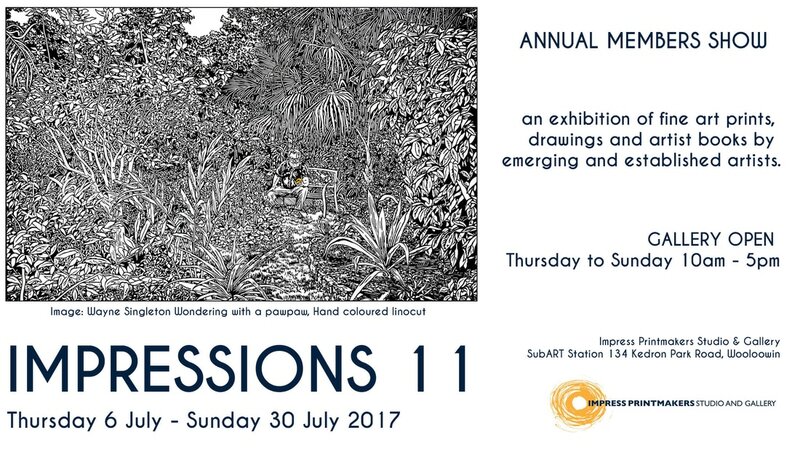 Impressions 11 is the 11th annual printmaking exhibition for all interested Impress members. Beginners, emerging and established artists are all welcome to enter artwork. Please email gallery@impress.org.au if you have any questions. This is an opportunity for all artist members of Impress Printmakers Studio whether emerging or established to exhibit their artwork. ARTWORK: Up to five x (A1 max) unframed unmounted works can be submitted (one of these may be framed). Each of the artwork must have some type of printmaking or drawing within them. They can be artist books, prints, 3D/ sculptural prints. If you are unsure about your artwork please email the exhibition coordinator with a .jpg and your concern. ​SUBMIT: Entry form, small .jpgs for each of your artworks and the completed task checklist for the exhibition to the exhibition coordinator by Sunday 2 July 6 pm. ​DELIVERY DATE: Works must be delivered before or on Sunday 2 July until 6pm. A marked drawer will be available in the gallery for the reception of unframed works. Framed works can be stacked against the wall in the kitchen nearest the back door and beside the lockers.